Thanks to Brian George for these two shots of 133 in the new livery. It does work well on these buses. That looks excellent! I would now say 133 is my favourite bus in the fleet; it has the great engine, super quick accelaration, and plenty of power (134 was on the 50 the other week and had more than enough power for getting up Keswick Crescent which a lot of Darts struggle with), and the fantastic new livery. 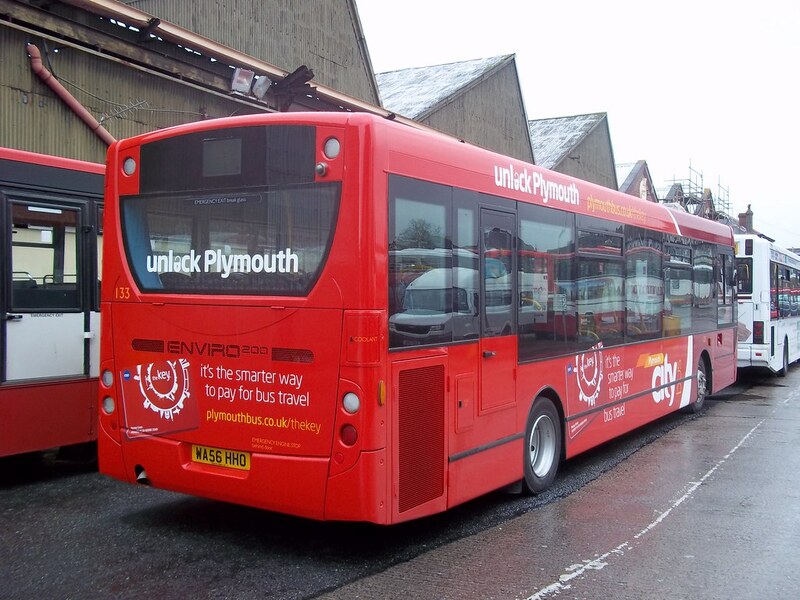 134 and 135 will be re-painted; this has been confirmed by Plymouth Citybus on their facebook page. They mention the 'contract has expired' - does this mean they'll be dropping the 34? Or does it mean these buses will be moved from the 34 and put on another 2 an hour frequency route? The only other 2 routes I can think of that are every half an hour are the 27 and the 20, which both have pretty boring/standard buses, or there's the 43A/43B, although these tend to have nicer buses, e.g. 54-reg Darts and double deckers, although the other day there was a Solo on the 43A! The contract they are talking about is the wrap around pictures for the Royal William Yard which was paid for I believe by the company that regenerated that area. The service 34 will continue as normal. Regarding 133 to 135 they can be put on any route without having Route 34 on the side of the bus. The 43A gets alot of variety, mostly good stuff but can have the likes of 8 or 2! I think the Plympton services need better variety; the 21 always has a Citaro and the 20/22 are always 2002/2003 Darts. On Sundays the 20 and 22 both use Citaros. 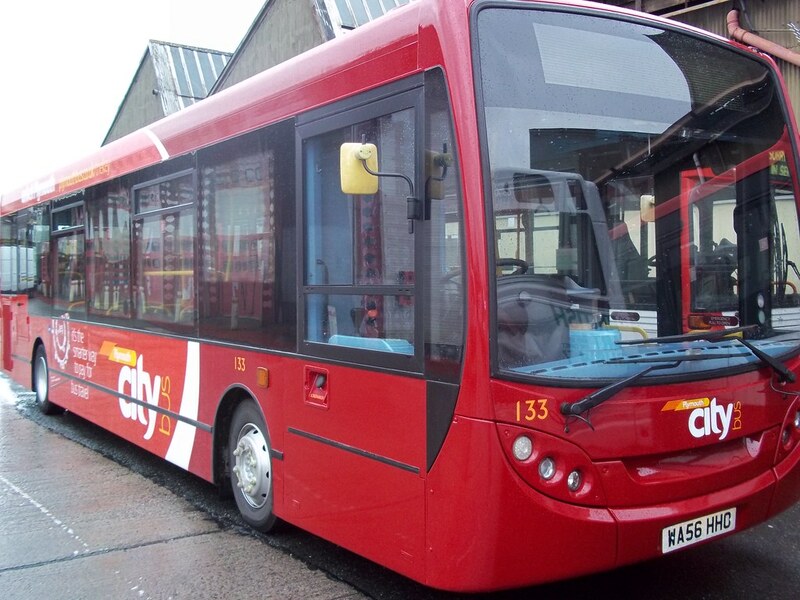 I would like to see Citybus replace the N-reg batch of Dart SLFs with maybe some Enviro 200 hybrids/Citaro hybrids? I seem to remember reading somewhere there's government funding for buying Hybrid buses, although for the life of me I couldn't remember where! Anyway, I can't see darts 1-12 lasting beyond the end of next year really. Who owns the SPD in front of this enviro? It's Citybus number 29, it's in the colours of the British Art Show. Does anyone please know what happened to Darts 6 and 11, can't find photos of them anywhere and can't remember ever seeing one!!!! 134 and 135 are obviously 'next-in line' for the repaint into the new livery, after that I would imagine that 29 would be the next; the front of it is already in the new livery. This bus was actually on the 34 today! 134 was on the 28/A. Bus 67 has had yet another repaint into this livery, 67 was on the 8 and 9 today. A few unusual buses were on some routes today, the 40 had 1,8,9,10, the 41 had 75, and the 50/61/62 had 137. The buses on the 50,61 and 62 all 'swap into eachother' throughout the day, at Derriford, there was a 61 that changed into a 50, at Royal Parade a 50 changed into a 61 etc. An Enviro was also on the 35! N105 was on the 25; unusual, as this is normally a Mini Dart.